Contact Lenses Online Just For Canada. Spring Sale is HUGE This Year! What Is This Handling & Return Guarantee? PODCAST: Guns – Part 1. Gun Control, Registration, Facts, and more. PODCAST: Positive Thinking Changes Your Life! Suicide In Our World: We Can Do Better Every Single Day! August 23 2017 Podcast: Prisons – Helping or Just Making More Violence? Back To School Coupons For Everyone! OFFER EXTENDED! Save up to $50 on your contacts! Shannon Cross knows we are the best at what we do! Louise Gaynor from Etobicoke, Ontario, left us an amazing review! Grace Ngai from Toronto, Ontario, left an AWESOME review! Erin Purcell, from Toronto, Ontario is super happy with us! Liane Cournoyer was blown away about our mission! Sara G. was impressed with our customer service! Orenda David loves to help save the planet through us! Lower Prices, Faster Shipping and… CFL Plus? Mike Jacklyn Googled us and is happy he did! Tatyana S. didn’t know her friend used ContactsforLess.ca too! Laura Friesen plans to purchase her contacts through us again! Mark Allen from Toronto, Ontario, loved his first purchase! Egale.ca is ContactsforLess.ca’s November Group of the Month! Joanne’s husband was impressed with ContactsforLess.ca! Jordan Joe loved ContactsforLess.ca’s Customer Service! Becky Stewart from Toronto, Ontario, loves us! Erin Purcell from Toronto, Ontario, knows we’re reputable! Holly Weiss from London, Ontario, is a loyal customer! Winner of the $200 in Free Contact Lenses Contest! Video: Save Money, Save the Planet. Huge Summer Sale is ON! Trish Wright from Deroche, B.C., recommends us to others! Alicia Currie was impressed with our service! Save The Children: our Group of the Month for June 2016. ContactsforLess.ca’s Global Fund for Women Video Message! Big news for You, Us, and the Planet! Air Optix Colors Rainbow Pack Now Available! Can Acuvue Define Contact Lenses Make You Look Prettier? Clariti Contact Lenses – Now Available! Winner of our $200 Contest! Win $200 in Contact Lenses! Why Should Companies Employ Social Responsibility to Help the Planet? Can Contact Lenses Save the Planet? Will Climate Change cause new epidemics? 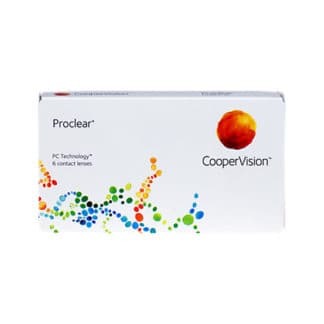 CooperVision’s Proclear family is designed to offer exceptional levels of comfort for all types of wearers, with contact lenses catering for short-sightedness, long-sightedness, astigmatism, and presbyopia in both daily and monthly disposable forms. Their PC technology allows for “improved comfort for contact lens wearers who experience mild discomfort or symptoms relating to dryness during lens wear”. The technology works by attracting the eye’s natural tears and binding them to the surface, holding water against the lens for longer. This stops it from evaporating, preventing dryness and makes these lenses an excellent choice for dry eye sufferers. In fact these contact lenses are among our best-sellers, with Proclear, Proclear 1 Day and Proclear Toric being particularly popular. They also offer a world first with Proclear Multifocal Toric, designed for simultaneous correction of astigmatism and presbyopia. Order your contact lenses online from ContactsForLess.ca today, and get super fast delivery. All orders $100 and over receive FREE SHIPPING. Get access to exclusive subscriber-only promos! Be the first to know about flash sales and other exciting deals! We will never sell your information to anyone. Contactsforless.ca is an official distributer for Acuvue, Alcon, Bausch & Lomb, and Coopervision. All contact lenses on Contactsforless.ca are approved by Health Canada. You can unsubscribe any time you want.